Mr Uche, Dear young friends, thank you for your warm welcome. Heart Speaks unto heart, as you know I chose these words so dear to Cardinal Newman as the theme of my visit. In these few moments that we are together I wish to speak to you from my own heart, and I ask to open your hearts to what I have to say. I ask each of you first and foremost to look into your own heart, think of all the love that your heart was made to receive, and also love it is meant to give, after all we were made for love. This is what the Bible means when it says that we are made in the image and likeness of God. We were made to know the God of love, the God who is father, son and Holy Spirit, and to find our supreme fulfilment in that Divine love that knows no beginning or end. We were made to receive love, and we have. Every day we should thank God for the love we have already known. For the love that has made us who we are. The love that is shown us what is truly important in life. We need to thank the Lord for the love we have received from our families, our friends, our teachers, and all those people in our lives who have helped us to realise how precious we are in their eyes, and in the eyes of God. We were also made to give love, to make the inspirational for all we do, and the most enduring thing in our lives. At times it seems so natural, especially when we feel the exhilaration of love, when our hearts brim over with generosity, idealism, the desire to help others to build a better world — but at other times, we realise it is difficult to love. Our hearts can easily be hardened by selfishness, envy and pride. The Blessed mother Theresa of Calcutta, the great missionary of charity reminded us that giving love, pure and generous love, is the fruit of a daily decision. Every day we have to choose to love and this requires help. The help that comes from Christ, from the wisdom found in his word. 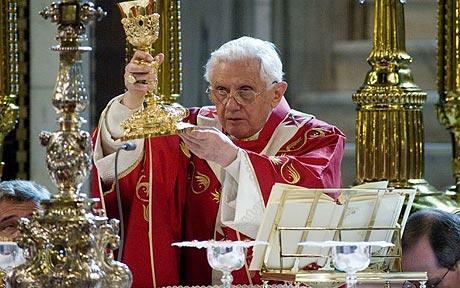 And from the Grace which he bestows us in the sacraments of his church. This is the message I want to share with you today. I ask you to look into your hearts, each day, to find the source of all true love. Jesus is always there. Quietly waiting for us to be still with him and to hear his voice. Deep within your heart, he is calling you to spend time with him in prayer, but this kind of prayer, real prayer, requires discipline. It requires time for moments of silence every day. Often it means waiting for the Lord to speak. Even amidst the business and stress of our daily lives we need to make space for silence, because it is in silence that we find God. And in silence that we discover our true self. And in discovering our true self we discover the particular vocation which God has given us for the building up of his church and the redemption of our world. Heart speaks unto heart. With these words from my heart, dear young friends, this is word’s from my heart.I assure you of my prayers for you. That our lives will bear fruit of the cross, of the civilisation of the cross, I ask you to pray for me, for my Ministry as the successor of Peter, and for the needs of the church throughout the world. Upon you, your families and friends, I call on you God’s blessing of wisdom, joy and peace.